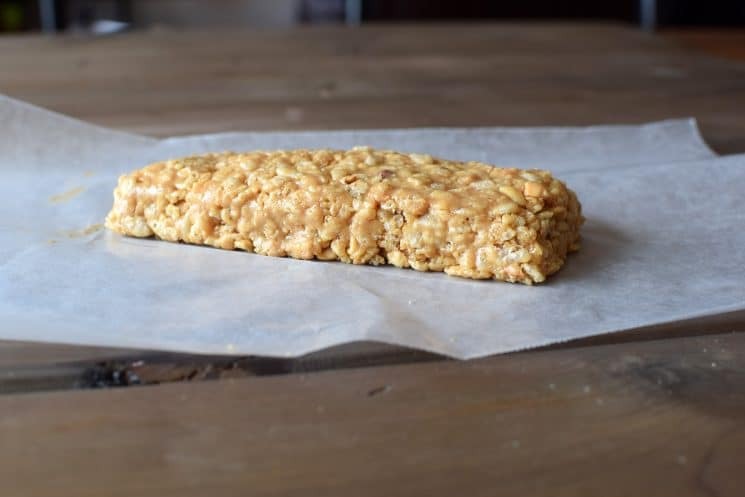 Super soft, only 3 ingredients and WAY less processed sugar than regular rice crispy treats. These might be your new go to treat. A new cookbook is out, and I love it! Our friend Arman from Big Man’s World writes the most delectable recipes for healthy desserts! Many of the recipes in his new cookbook, Clean Sweets, are for one or two servings, and are high in protein. Not exactly a family cookbook. BUT- if you are like me, and making one or two servings of dessert is a MUST so you don’t over do it, you will want this cookbook! 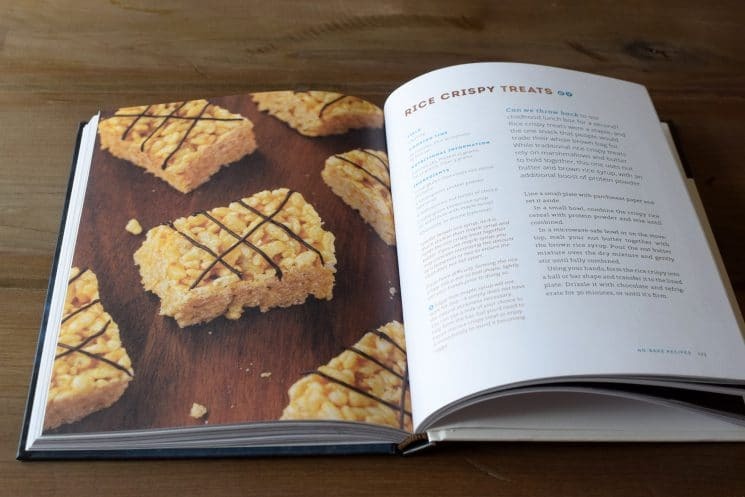 When I first got the cookbook, the rice crispy treats recipe on page 123 REALLY jumped out at me! Not only do I LOVE rice crispy treats, but it brings me back to my childhood in a way that I can’t explain. Traditional rice crispy treats with their marshmallows and butter never truly hurt anyone, but when you can recreate these beauties and have them TASTE BETTER, why wouldn’t you! I doubled the recipe so I could have 3 squares, but my family loved it so much, I’ll likely triple or quadruple it next time. The other great thing about this recipe was how QUICKLY you can make these rice crispy treats. Whether it’s an after school treat, or after dinner, you literally only need a couple of minutes to make it happen. The first thing we did was melt together some peanut butter and brown rice syrup in the microwave. Both my ingredients started out super runny, so I only did this for about 30 seconds. 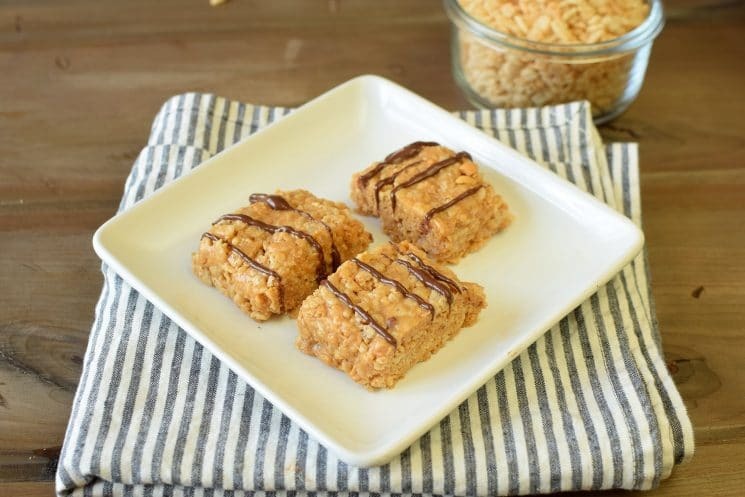 After the peanut butter and brown rice syrup was sufficiently soft, we add the rice crispy’s. Mixed together, I sprayed my hands with some cooking spray (I always do this if something is a bit sticky to work with), and I formed one long bar. Seriously- That’s IT!! It’s done at this point. Just cut and serve! I prefer brown rice syrup. It is much stickier than maple syrup and holds the rice crispy treat together better. If you use maple syrup you may consider increasing the amount by a teaspoon or two to ensure the treat does not fall apart. 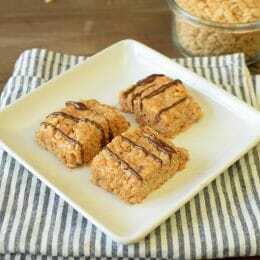 If you have difficulty forming the rice crispy into a bar or ball shape, lightly wet your hands prior to doing so. 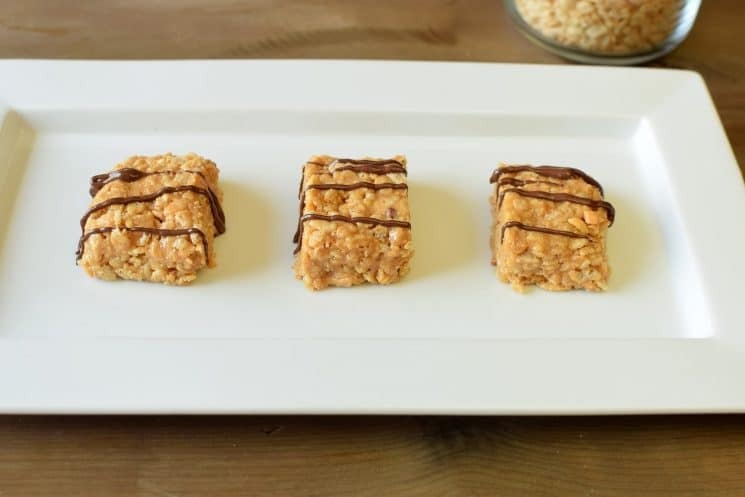 How Far Ahead Can You Make Rice Crispy Treats? Honestly? Rice Crispy treats are best the same day. You can keep them from getting too hard by really sealing them well with saran wrap and keeping them in an air-tight container. This method should keep them good for 2-3 days but they are just so much fresher the same day. How Do You Store Rice Crispy Treats? Can I Freeze Rice Crispy Treats? The answer is yes! They won’t taste like they do when they are fresh out of the pan, but still they are good after being frozen. Place your rice crispy treats in a single layer inside a resealable freezer bag. Once the treats are inside the bag, squeeze out all excess air and place it in the freezer for up to six weeks. When you’re ready to serve the treats, remove them from the freezer and let them sit at room temperature for 15 minutes. The main reason they get hard is because of too much heat when melting ingredients. When you melt the peanut butter and brown rice syrup, heat just long enough so they get melty and combined. Heating them for too long results in a hard and crispy rice crispy 🙂 And really we want chewy and gooey rice crispy treat. I hope your kids love this recipe as much as mine did! Line a small plate with parchment paper and set it aside. 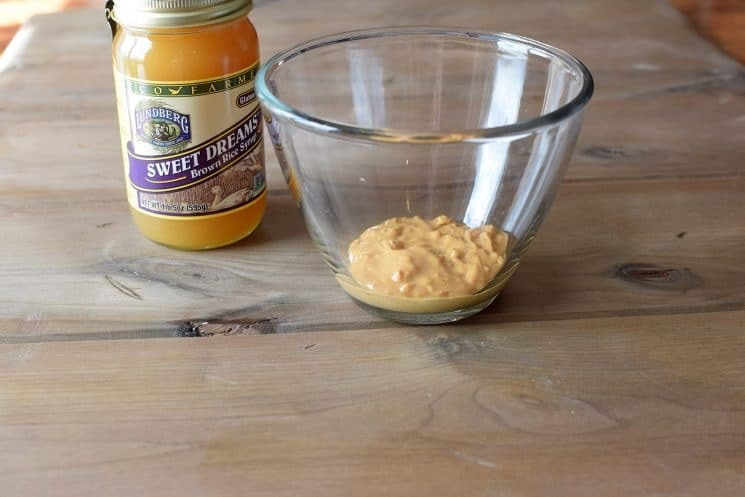 In a microwave safe bowl or on the stove top, melt your nut butter together with the brown rice syrup. 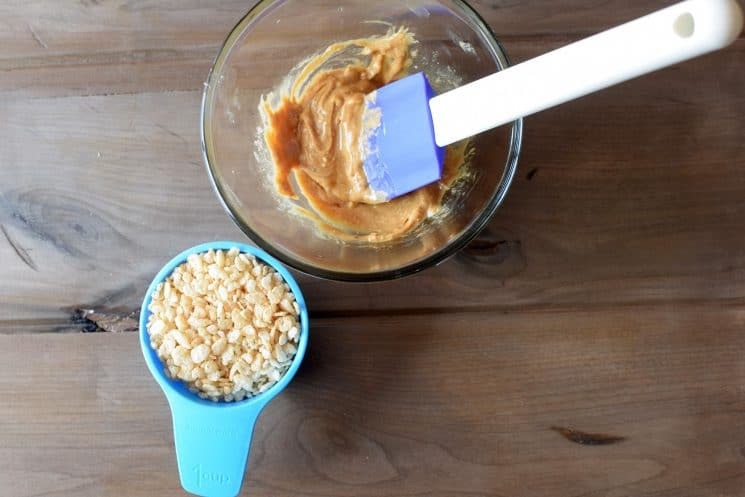 Pour the nut butter mixture over the dry mixture and gently stir until fully combined. 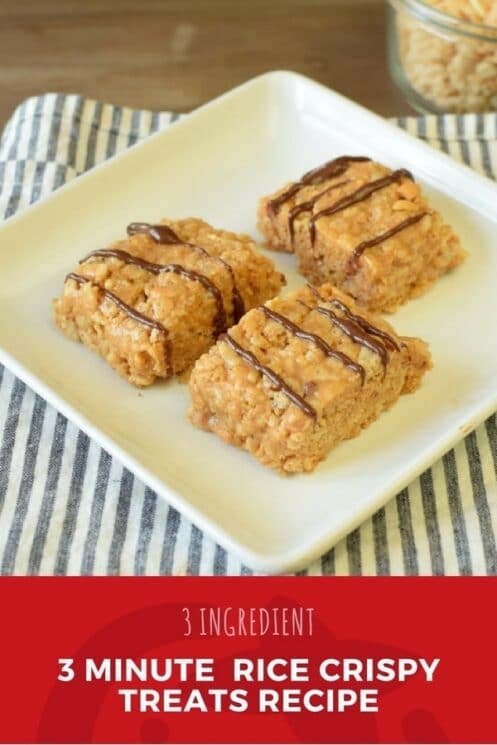 Using your hands, form the rice crispy into a ball or bar shape and transfer it to the lined plate. Drizzle it with chocolate and refrigerate for 30 minutes, or until it’s firm. Note #2- the original recipe was written with protein powder as an optional ingredient. We didn’t use this. Yes you can – it will just change the flavor. I count 4 ingredients. Maybe put the word Optional next to the chocolate? Thanks.